Sound Unbound was a weekend festival at London's Barbican Centre that released classical music from its traditional confines, allowing visitors to engage with a number of short sessions, take part in debates around the genre, live tweet from the concert, or go all night with a classical overnighter. The festival was a joint project between the Barbican and its artistic partners: the London Symphony Orchestra, the BBC Symphony Orchestra, Britten Sinfonia, the Academy of Ancient Music and the Guildhall School of Music & Drama. It featured over 64 taster concerts across a single weekend, showcasing the fresh face of classical music, with a mixture of established artists and rising stars chosen for their commitment to connecting with audiences. The Weekender was a chance for audiences who are curious about classical music to connect with it in a new way, with an unparalleled variety of music and an emphasis on informality. "We were trying to reach out to people who wouldn't necessarily listen to Classic FM or Radio 3," said Mark Bloxsidge, Technical Manager at the Barbican Centre. "It's a way of delivering a taster for a younger audience as well. We tried to make it a bit more relaxed than traditional classical events, with shorter performances, very reasonable ticket prices and diverse content. "We offered a wide range of content from organ recitals at St Giles church, to film screenings and concerts from the London Symphony Orchestra and BBC Symphony Orchestra, featuring music from medieval to modern, from classics to premieres." A total of four Panasonic AW-HE130 remote cameras were used to provide broadcast coverage of the main hall. One camera was rigged on a lighting bar facing the stage, a second was mounted on the proscenium arch at the side of the stage, while two were placed on tripods on stage, so that they could be moved between performances to optimise the level of detail each would capture. This highly sensitive camera is equipped with three newly developed 1/2.86-type MOS sensors, allowing for highgrade filming even in low light conditions. The output was projected on to four metre projection screens by two Panasonic 10,000 lumens projectors, while a further two were hired to relay the various events taking place across the Barbican. Mark Bloxsidge, Technical Manager at the Barbican Centre, "We are grateful to Panasonic for supporting the event with the camera equipment, it certainly enhanced the festival. "Many of this audience are used to festivals and pop concerts where the audience is brought closer to the action with the use of giant screens, it's what they expect. Sound Unbound was an exercise in making classical music more accessible. It was just the pop music of its day, after all. Close-up detail of the musicianship and an insight into how the conductor controls the Orchestra was relayed in crystal clear HD. The footage was displayed in both the auditorium and the foyer, where people could watch it for free, or listen to the concert before they went to see one of the other 'Sound Unbound' events taking place across the weekend. In total, three people operated the Panasonic studio system behind the scenes. 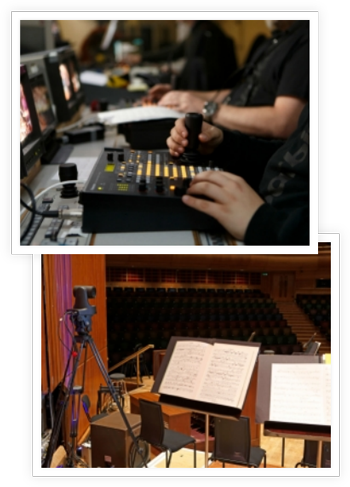 Barbican Technical Supervisor, Martin Shaw and technician Jack Jordan, were each equipped with an AW-RP120 controller and managed two cameras each. Jeremy Garside, Head of Technology for the London Symphony Orchestra, acted as director for the weekend, using an AW-HS50 switcher. As a musician he was able to follow the score and direct the cameras to switch from one section of the orchestra to the next. "Directing camera operators at a rock concert is relatively easy as all the band members will usually be playing at any given time" added Mark Bloxsidge. "But in classical pieces, there may be whole sections of the Orchestra that won't play anything for five minutes. We needed to know when the various instruments would be used and pre-empt the camera movement. The multi-viewer output on the AW-HS50 was great. We were surprised that it was able to do everything we wanted from such a small unit." "The reason we used the AW-RP120 controller was so that we could use the pre-sets to set up the shots ahead of the shows. Our operators had prepared shots of the strings, brass and so on, and could then change shots with one button when requested to do so during the show. "What was impressive was that our technicians were able to operate two cameras from a single controller very quickly despite having no prior experience with this model, this speaks volumes for the usability of the controllers." 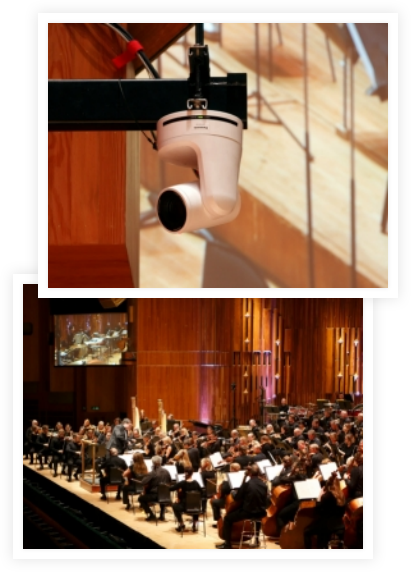 Noise is also a consideration for any system implemented at the Barbican. The venue still owns and operates a system called BTV which was installed in the early 2000s, and featured standard definition Panasonic cameras on a prototype PTZ system. It was initially installed as part of a joint venture with the BBC, but can no longer be used for broadcast because of the resolution of the cameras. "All of the existing rigs have fans in them, which has caused us concern in the past as classical music is unamplified and often features very quiet sections. We were delighted to find that, over an extended trial across the weekend, the AWHE130 had no discernible fan noise or mechanical noise," added Mark Bloxsidge.